Ali prepared boiled eggs and toast for breakfast and we were all ready to leave by 9 am but I was on the phone trying to get information from motorcycle dealers in Adelaide. We took Stuart Hwy south to Erldunda Roadhouse where we filled up with fuel and had a drink . 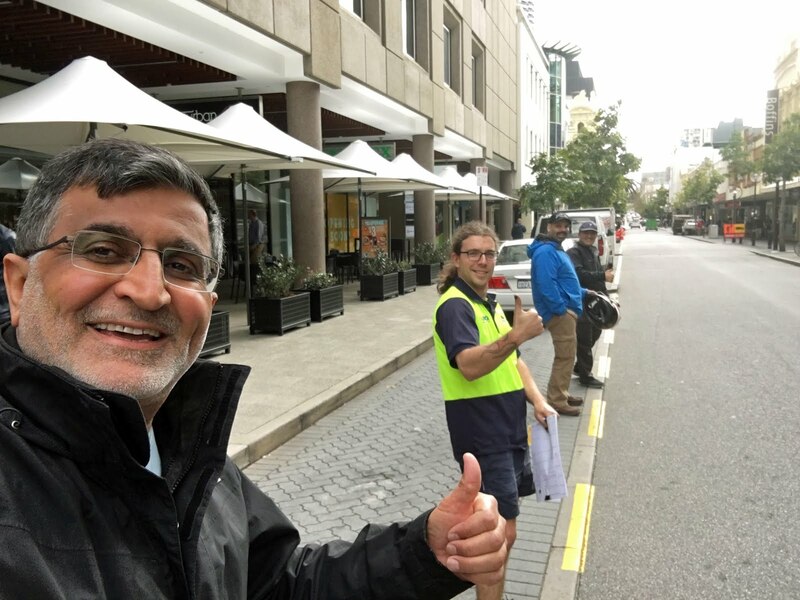 We also mingled with other travelers and the Citreon 2CV club that husain was admiring since he has three of them. On the way we saw Emu and Ali stated that he saw a small bird fly into my bike, since the speed limit was mostly 130 km/h we saw and generated plenty of roadkill. Like home the lizards on the road don't move when you wize by them and with three of us right after each other one of us is bound to run over it. Our rooms were 20 meters under with shaft vents that had inverted umbrellas underneath them to catch small falling stones which you can hear since it is really quite. Also there is no air conditioning since the temp is always around 21 to 22 deg c.
Ali made breakfast and we went straight to pack our bikes and checkout of Emu Walk Apartments. Since we had passes to the National Park which last a couple of days we went in and started to look for a good place to take a picture . All along the road there were people parked where they can to take photos. 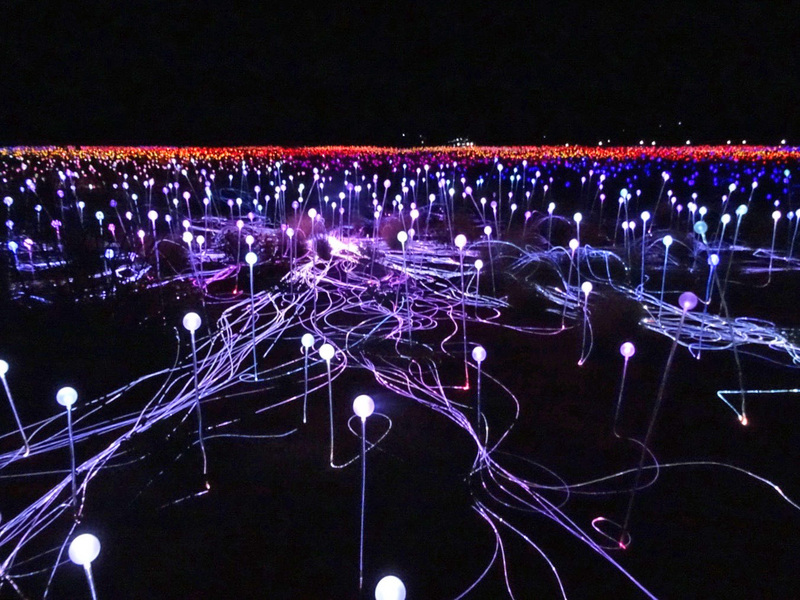 We found a good place, took our pictures and headed straight to Alice Springs. 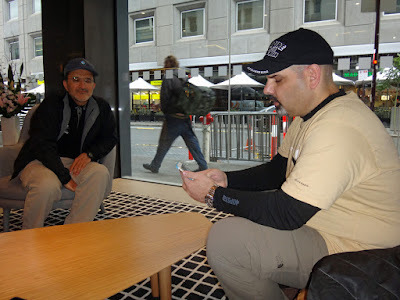 once we put in the destination my GPS was 20 km distance less than Ali and Husain. 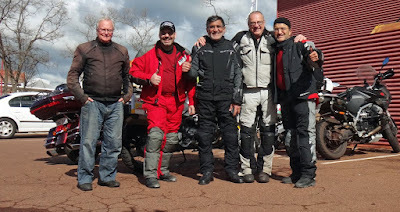 once we started riding a turn came up and I asked the guys if they had it other GPS , they said no , so I checked the map and it was going to take us through another route that had unpaved parts. I set the GPS to avoid unpaved roads and away we went. after 4 days of unpaved roads we want a long break. 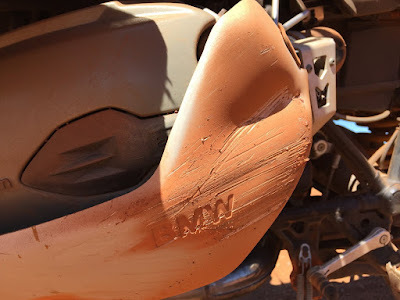 We arrived in Alice Springs unloaded our things in the hotel and headed into town first to the motorcycle shop to see if I can get a new helmet but the selection was pretty bad. Then we had a quick bite at a Mexican restaurant, and got fuel for our bikes. 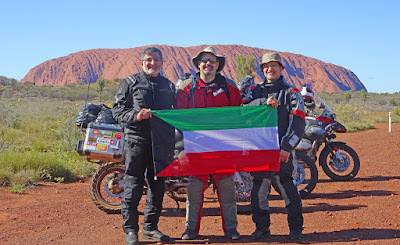 Tomorrow we have a long ride to Coober Pedy. 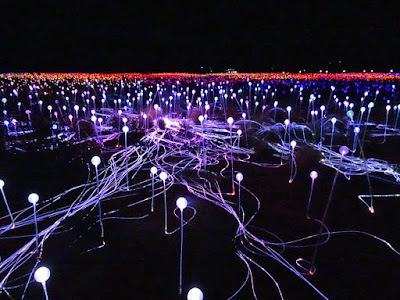 Yesterday was a restful day from motorcycling with many activities at the Ayers Rock Resort, we attended a cultural dance story and took a tour to the field of lights exhibit, Here there are artists in residence so you can visit a museum and gallery. 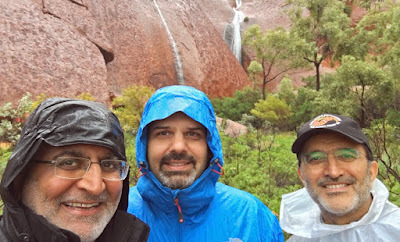 Today we wanted to ride out to Uluru (Ayers Rock) and take pictures but we woke to the sound of rain. So we did some cleaning and preparation and finally decided to take the Uluru express which is just a shuttle service to the rock. 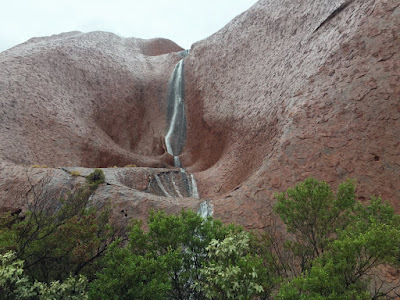 At the time we didn’t know that we would see the rock in a are setting with waterfalls all around it from the rain . Usually the falls are not continuous since we were told they stop about 20 minutes after the rain stops, but today it was continuous flow. We had a small walk around and until we got wet and a little cold. 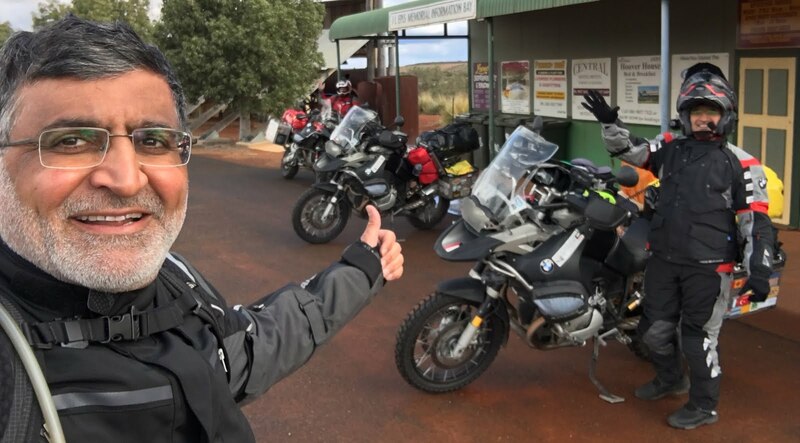 We got back and started planning our ride to Alice Springs tomorrow to start by just taking a picture with our motorcycles having the rock as a background. Since we are in a new time zone (Australian central standard time) it is sometimes difficult to judge how much time you need to ride. We finished breakfast at 9 am which one would think was a bit late until you consider that the sun rises around 7: 20 am . We got on the road around 10:30 am expecting the first 100 km unto Docker River to be the worst since that is what we were told. So we estimated 5 hours of riding to cover the 270 km until we reached tarmac about 60 km from Yulara. Unfortunately what we found was totally different, the road was really bad sandy corrugated loose gravel , and patches of muddy puddles. It was physically challenging, especially considering we had to stand most of the way, and I was still recovering from yesterday’s injuries. We had packed extra drinking water and strapped it to our panniers however the correlation was so severe that they fell out leaving us with only the water in our camelbacks. Six hours in and about 100 km left of still terrible road conditions we realised that we only have a little over two hours before sunset meeting that we will never reach Yulara before dark , and not sure whether we will finish the Off road section before sunset.About an hour later my bikes engine cutout in the middle of a rough patch, I suspected the side stand switch and I was right, it was dangling out of place and with all the vibration set that the side stand is lowered with cuts off the engine (a safety feature on modern motorcycles) . With my knee I couldn’t get under the bike to fix it so Husain and Ali managed to put the switch back into place and using a zip tie to secure it. 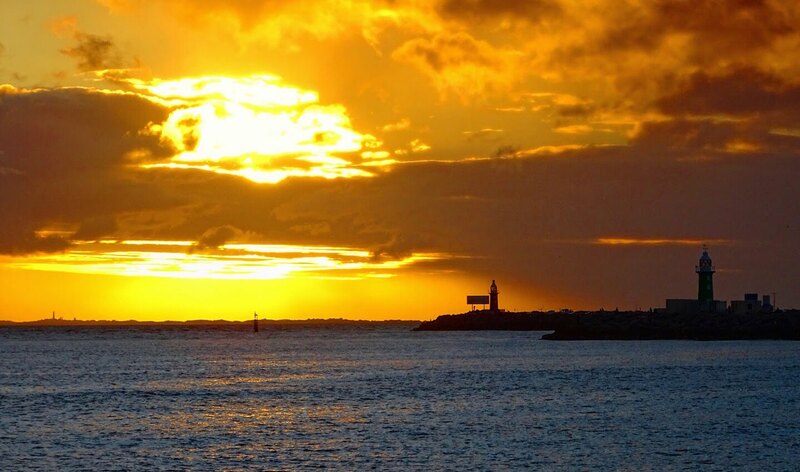 We had lost valuable time that we didn’t have . Exhausted we pushed on until the sun got so low the long shades of the tries made it difficult to see the details of the road which we needed to avoid loose patches. later we noticed that the shades were gone and the sun is setting we would have little daylight left and riding at night in these conditions would be a nightmare. suddenly I see car crossing at the end of the road with high speed which only meant that the off road section of our trip was almost over. 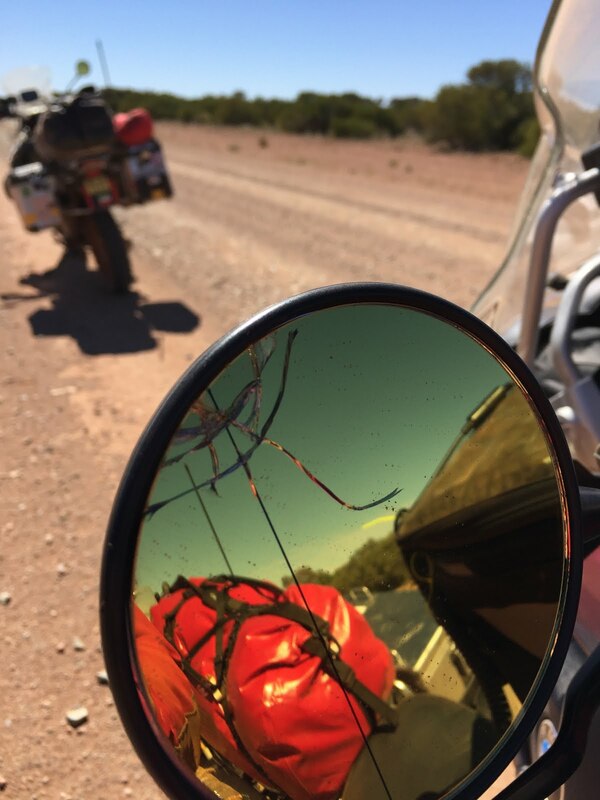 We stopped at the the entrance happy to have made it, All my mirrors were loose from the shaking so I had to fix them before getting on the road ( More time spent ) , and now we are riding in a national park after sunset in the dark with little over 60 km left to Yulara. Although the speed limit mentioned 100 km/h it was too dark for us to go that fast just incase animals were crossing the road giving us time to react and stop. So we were riding at a leisurely pace until a caravan passed us and we started to follow it happy to be on a asphalt again. 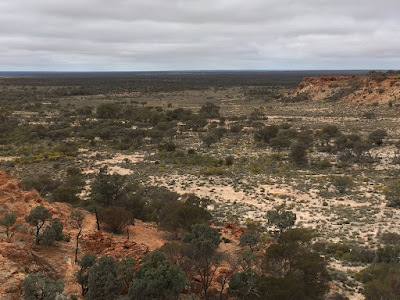 We reached Yulara with no Hotel reservations and by the time we got rooms it was 8 pm, we had nothing to eat since breakfast and the restaurants close at 9 pm. So we rushed and got our order in 1 minute before they closed. 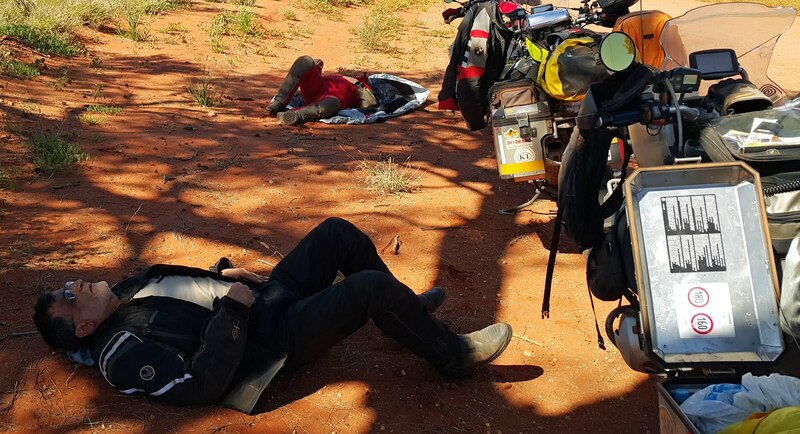 All is all it was a very exhausting day which made us want to rest at least 3 nights in Yulara to recuperate. Our next stop will be Alice Springs. 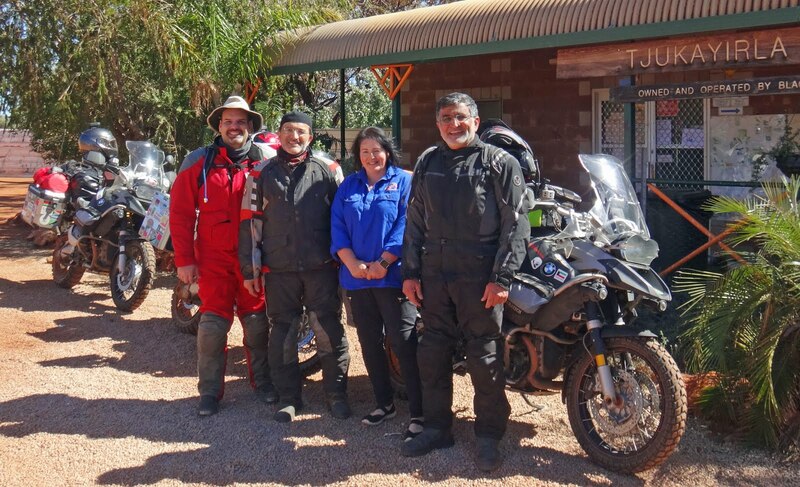 After a self made breakfast we left Warburton early and headed down the Great Central Road , we were told that the rough part would be at Dock River so we expected the road to Warakurna to be fairly good. For the most part is wasn’t bad except certain areas where there was no clear track and the gravel made everything slippery . There roads are unforgiving for motorcyclists since they run on the clear path of previous vehicles and avoid the gravel heaps on each side, but the track is very narrow and needs concentration if you look at anything else or get distracted you veer off and once your front tyre catches that wobble you go down. It seems that’s what happened to me since I don't recall how I started to wobble but once I did it got worse and I flew off the bike at around 90 km/h . One of the panniers was dislodged and all the contents scattered all over the road. I was mostly OK nothing broken just bruised and strained with my right knee and my left ankle both I believe got twisted. The left pannier was off the bike scattering its contents all over the road. 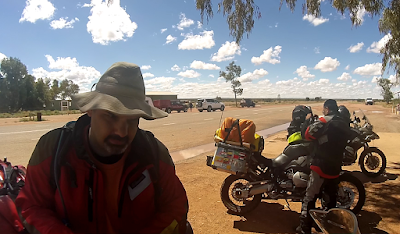 The guys picked up the bike and gathered the pannier contents , Ali kicked the pannier back into shape, we mounted the pannier taped up my helmet visor ( two screws missing) and continued to on a much slower pace to Warakurna Roadhouse. Once we reached there we filled up with fuel and I asked the attendant about the road ahead. He stated that the road was pretty bad for the next 100 km , and then it gets much better. It took a while for me to start moving again not only was I in pain but also exhausted from the ride with many sore muscles. I tended to my injuries and we all had a meal before they close for business at 5. 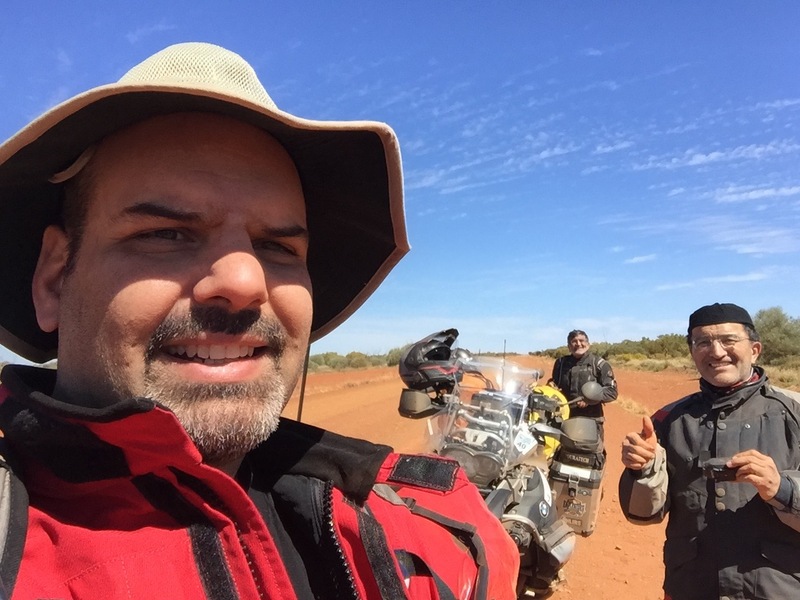 Tomorrow if all goes well we continue to Yulara and Uluru (Ayers) Rock. After a hearty breakfast by Serena we packed our bikes, filled them up with fuel and took a nice photo with Alan and Serena before we headed off to Warburton which was only about 3 hours away. Along the way we stopped for a about an hour while Husain tried out his Phantom 4 drone , took some images and reached Warburton around 3 PM . Since they only had takeout food, and well equipped shop we assigned Ali the task of cooking for us. There was a campers kitchen that we could use and Christa at the counted hook us up with pots and plates.Since there were Laundry facilities we decided to do some laundry too. 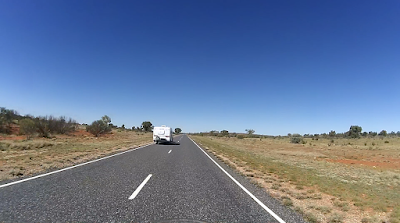 We decided to attempt to reach Yulara tomorrow and leave early even if we felt we couldn't we could stay at the Warakurna Roadhouse which is about 3 hours away. We woke up to a nice sunny morning , Husain ankle would hurt when he put pressure on it. We needed to make sure it wasn’t anything serious before we pushed on to Yulara so we went into shop to have breakfast and to talk to Alan & Serena on what we can do. They recommended to go back to Laverton and get it checked out, and lent us their pick-up truck to for the day as long as we picked up their mail and supplies. We thought this was very generous and left right after breakfast. 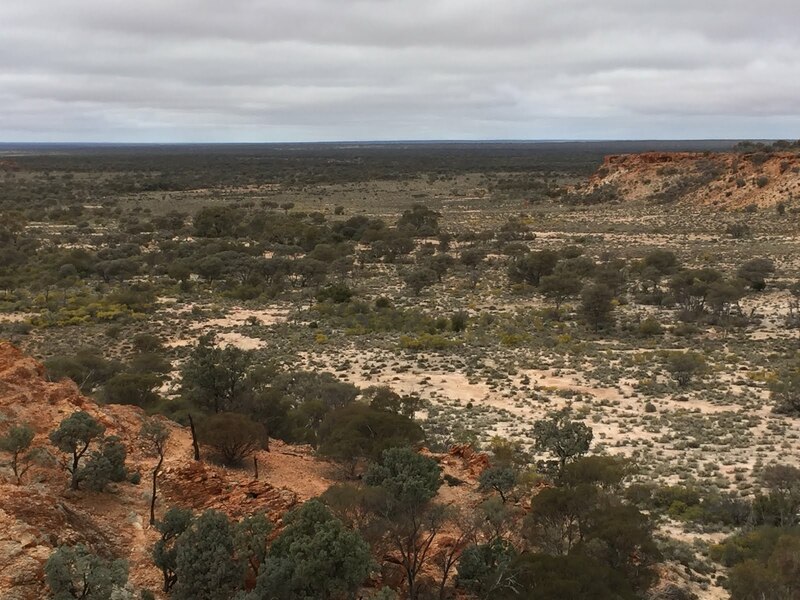 It took 3 hours to get to Laverton and on the way we saw a man riding his bicycle (they call it a push bike here) in the middle of the bush. We expect it would take him another two days to get to the roadhouse. 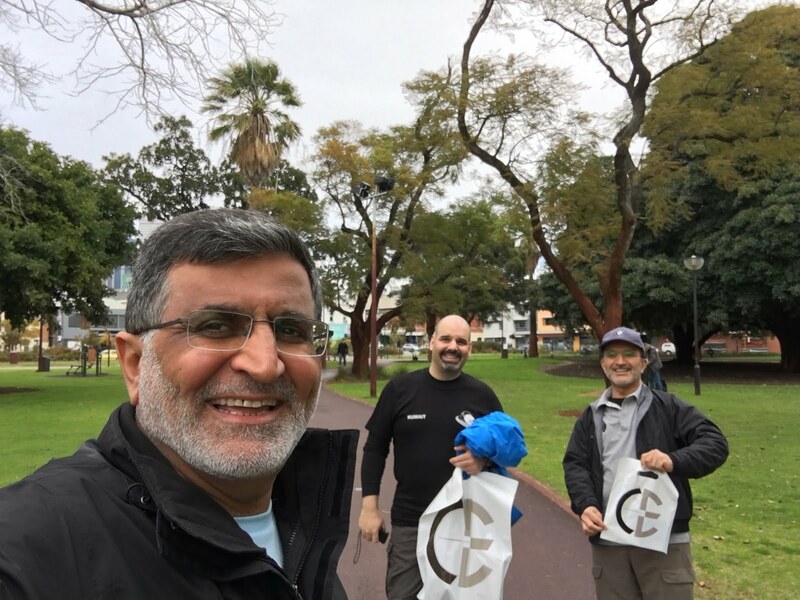 I dropped off Husain and Ali at the Medical Centre , filled the truck up with fuel , then picked up the mail which was being kept at caravan park in Laverton where we had stayed before , I left for the Medical clinic and waited for the doctor’s evaluation. That day there wasn’t a doctor on site so they had one video conference in , to observed Husain and asked him some questions and concluded that it was just a sprain and all he needed was some Anti inflammatory medication and painkillers. He mentioned that if it got worse he could seek medical advice again. 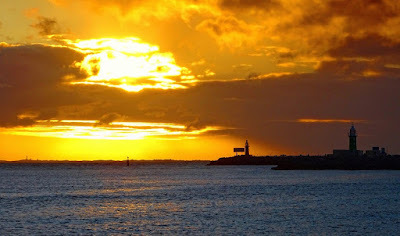 We went to the local store to pick up the supplies and we were on our way driving back, we waved tot he guy on the bicycle took a couple of pictures and get back just before sunset to taste Serena’s fish burgers and get a goodnight’s sleep before we head out to Warburton tomorrow. Since it is still winter here it is always very cold in the morning. 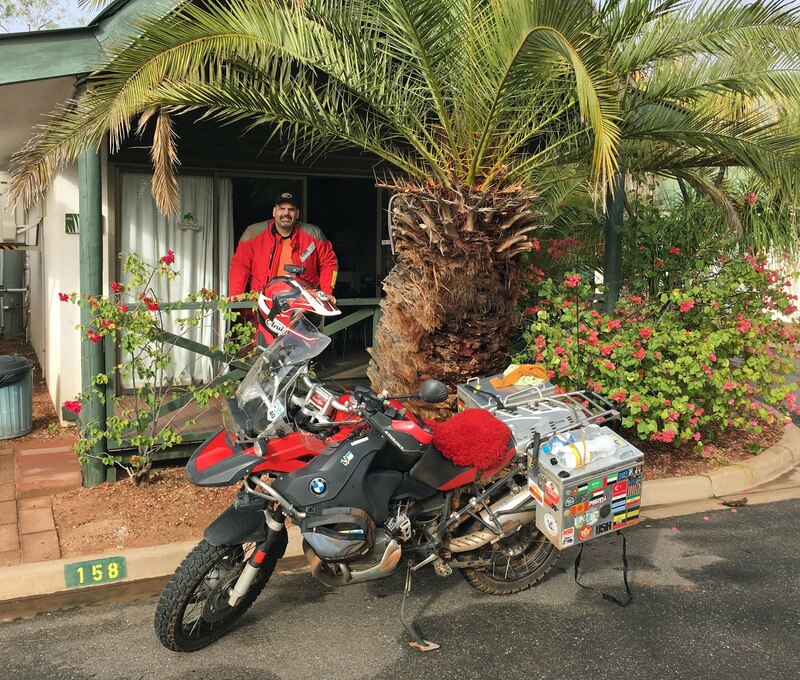 This time we had a kitchen and made our own breakfast , our bike were conveniently park right outside the door. 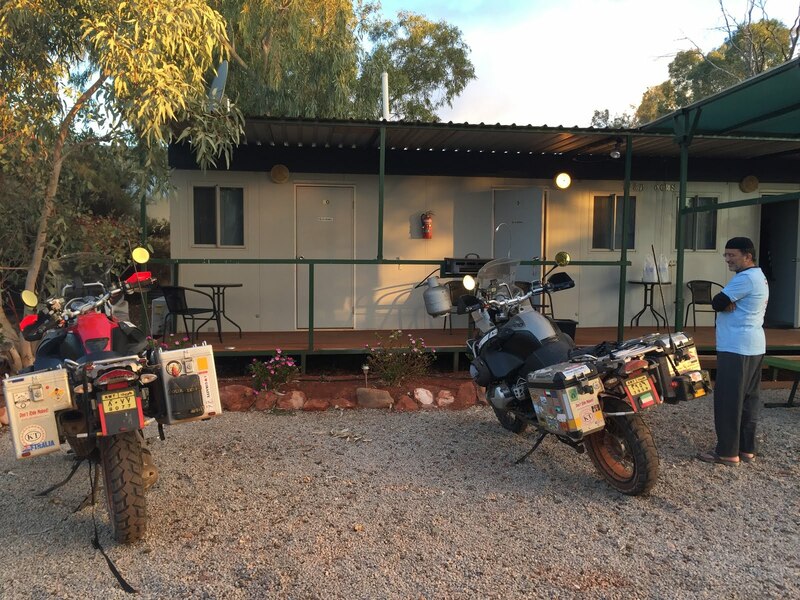 This is why we like motel type accommodations however it turns out that the best ones are in caravan parks. We left Laverton around 10 am with a full tank of fuel a cloudy overcast which was the end of last yesterdays rainy storm. we headed to the Great Central Road not knowing exactly what to expect. it is wide in many places and the sail here is red we didn’t see any trucks but we did see many cars pulling small trailers or campers. While riding at the beginning we were stopped by road construction workers who gave us the condition of the road. That is the main topic now , the condition of the road since it is all dirt and the only way to reach some of the communities. About two thirds of the way in we took a break since we were getting tired and my hands hurting me from gripping, since we need to stand much of the way to keep the centre of gravity low and keep the bikes stable. After the break right when we started to leave Husain hit some gravel while only holding the bars with one hand trying to close his helmet and managed while out . He was OK except for a hit he got on his foot , apparently it hurt but not enough to not ride. So we continued on to Tjukayirla Roadhouse. got ourselves some nice rooms and a meal. Unfortunately there was no internet and no cell service here so I tried to use the InReach device that we use for tracking to send a message but we didn’t get any messages back which was disconcerting since the reason I purchased it was for two way communication . Once I get internet I will investigate what is going on. 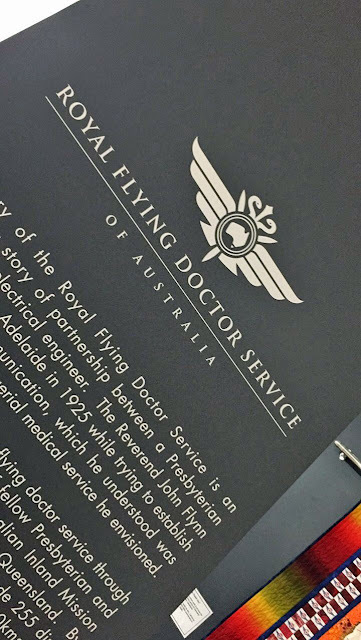 Since our next stop was to Laverton which was only 360 km away we decided to visit the Royal Flying Doctors Services and take a tour and found out that the creator is represented on the 20 dollar bill here in Australia, if you are lucky you get to see a plane unfortunately for us both planes were out . We did however leave with a great appreciation to what they do and the logistics of it all. with services ranging from just calling for medical advice and education to medical transport via a jet. At times they get permission to land on a highway. It has been raining all morning, and after the tour I was hoping that the rain would reduce , which it did just enough for us to pack our bikes and head north. The weather didn’t get any better with scattered rain and temps around the 11 deg C and then going down to 8.5 deg C. By the time we reached the caravan park in Laverton which is the best place to stay I started to shiver even though we had stopped earlier and I put on another layer of clothing . 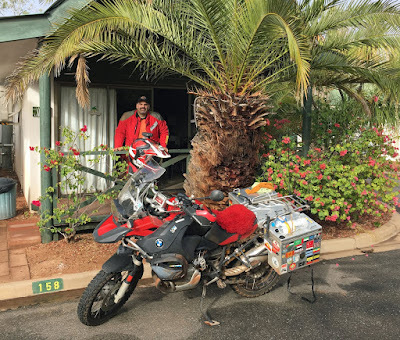 We got settled and went into town to the Desert Inn Hotel where they have the best cooked food, tomorrow we head into the outback on dirt roads for the next 4 days . When we arrived at the caravan park we were given a list of local restaurants, their address and when they were open. The only thing open on Sunday morning was Subway and the french bakery. So I decided to ride into town and get some breakfast from the bakery. I managed to get each an egg sandwich and a blueberry muffin. It was 8 deg C and luckily I can only do 60 km/h intown which made the trip manageable. 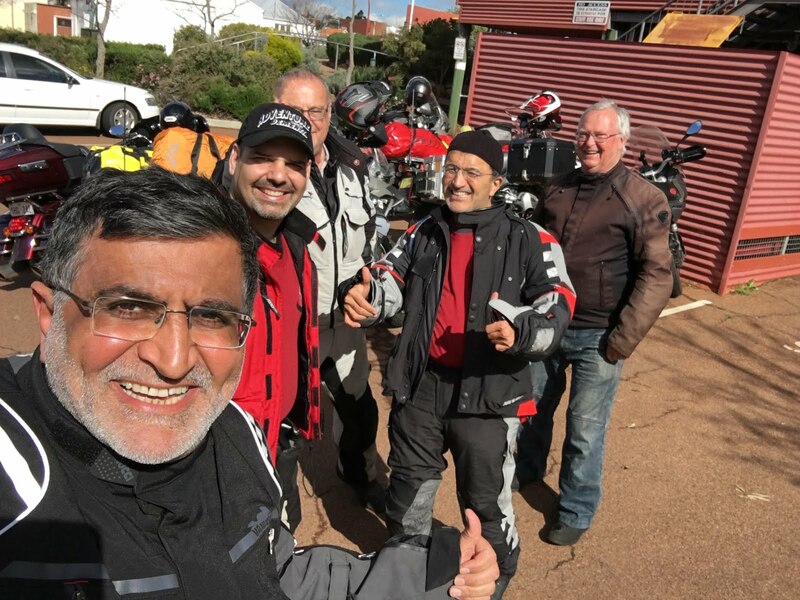 We ate packed up our belongings and headed east towards Kalgoorlie it was a very nice ride reminiscent of South Africa said Husain with the trees and the red sand. A rabbit crossed in front of my bike and Ali managed to see a dead kangaroo (Road Kill) amongst other furry smaller creatures that we don't recognize. I was on pins and needles yesterday morning waiting to hear if the bikes have been released especially after I called at 10:30 am and there was still no news. I got really worried when Arpan from Star Movers stated that officially they take 24 to 48 hours , but they are usually much faster than that. Then I got the call around noon and all was OK we would get the bikes delivered as promised with in 2 to 3 hours. Yes I don't need to make another one night reservation with the hotel. Once they were delivered we started working right away organizing our panniers and finding places for all out things. Ali told me last night that he got a message from Simon and that he will be riding with us from the hotel until our first rest stop (coffee break). In the morning we packed our bikes and Found Simon and his friend Mr. Andrew Macksey waiting for us, after a brief chat waiting for some of us to finish getting their bikes ready we decided it was time to go if we ever wanted to reach Southern Cross in time. Ali and I started our bikes and we waited but Husain's bike wouldn't start. The battery was almost dead . we decided to try to dry start while going down a ramp in the hotel parking but no such luck. 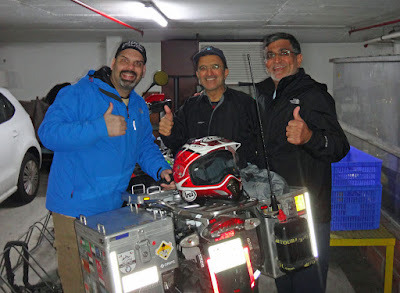 Then Husain stated that he had a powerful battery that can jump start his bike, it was out of charge. So Ali went and talked to Simon, and Andrew stated that he had a battery pack that could jump start the bike and went home to get it. less than an hour later we got Husain's bike started and we headed on our way. Luckily it a Saturday so the traffic was light. 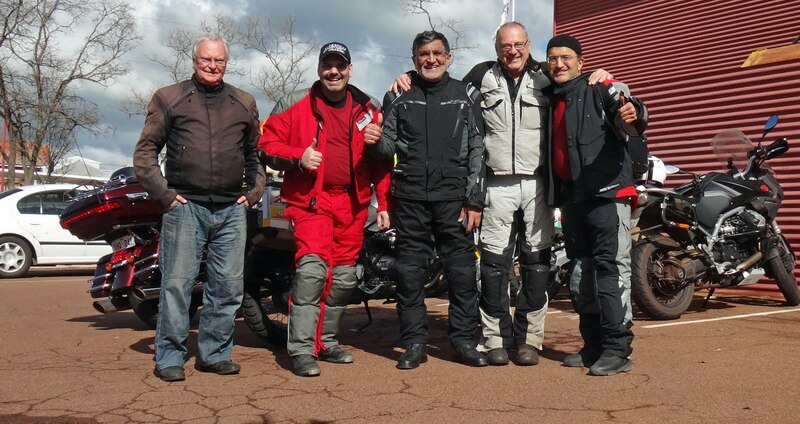 We first stopped at a petrol station and filled up all the bikes. 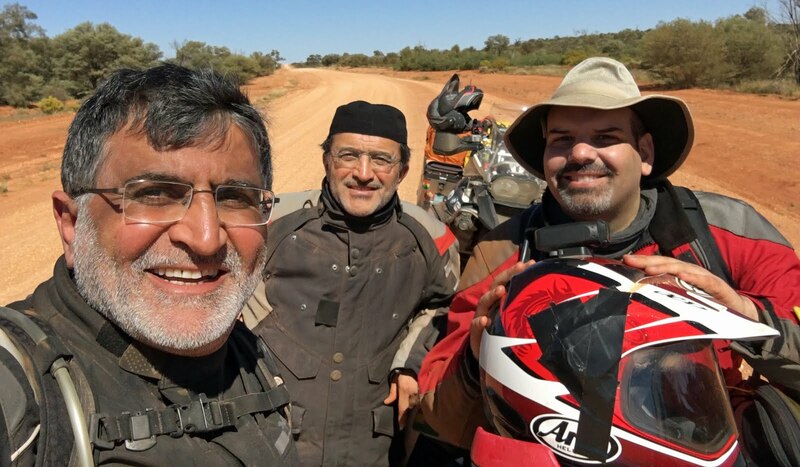 with only ten minutes of riding we wondered if Husain's bike would start, fortunately Andrew still had the battery pack just incase , but it turned out that we didn't need it. Husain's bike started right away. 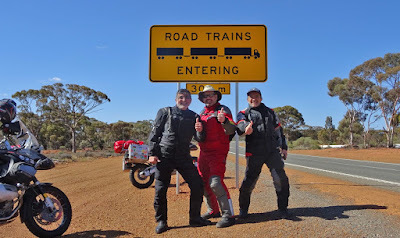 We rode until we reached the Great Eastern Highway (Route 94) and then continued for almost an hour until we stopped for some coffee a said goodbye to Simon and Andrew. We spent some time adjusting our stuff and setting up cameras that resulted in us not being able to reach Southern Cross since we were warned not to ride during dawn or dusk ( thats when the animals come out to play) , and we don't ride at night so we got as far as we could which was Merredin. 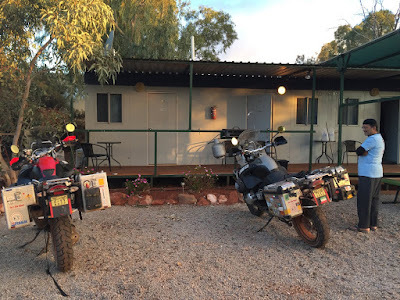 We found a place to stay at the Tourist Park Merredin (Caravan Park) where they had nice small Chalet type with a bed a fridge a bathroom, and a heater which we were thankful for. My room came with two friends in the form of small black spiders in the corners, one right above my head feasting on all the insects that would get in once you opened the door. 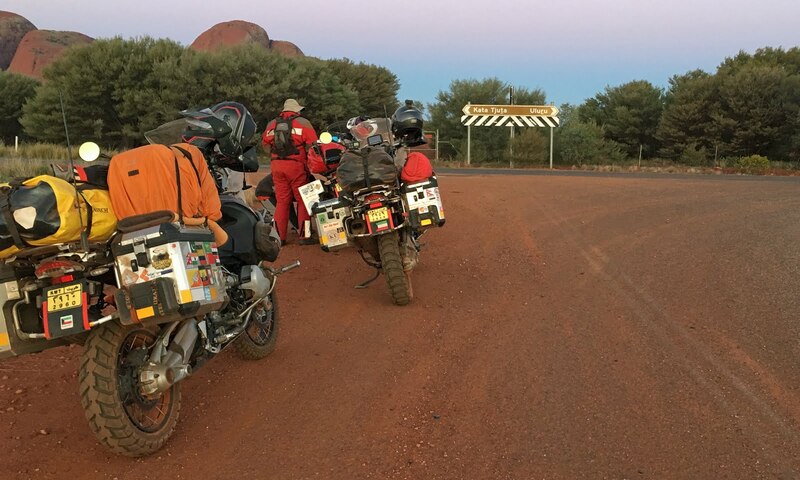 Dinner was a quick ride to the local Subway for a nice tuna sandwich, tomorrow we try to get to Kalgoorlie . 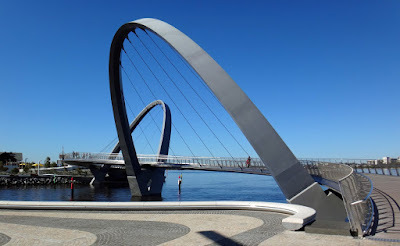 It has been a week since the container arrived and 5 days since we have been here in Perth with no motorcycles . 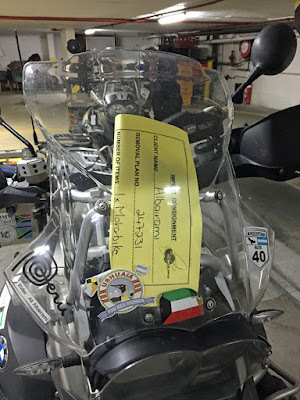 I think this is the first and last time we sea freight our bikes to a location, the difference in price slowly disappears as the money you saved is spent on hotel and transport waiting for your bikes to be freed from captivity. Last we heard yesterday is that they cleared customs and that they are scheduling an inspection appointment for quarantine. Today we were told that the inspection is completed and that we are waiting for clearance certification. Which we hope arrives tomorrow with our bikes. In the meantime we are keeping ourselves busy, our first days were spent shopping. A waterproof cover for the Phantom 4 , and video camera bag, microphones . And soon noticed that Perth is one of the most expensive cities in Australia. A bottle of water is 3.95 AUD which is almost 900 fils in Kuwait we don't pay that at restaurants. 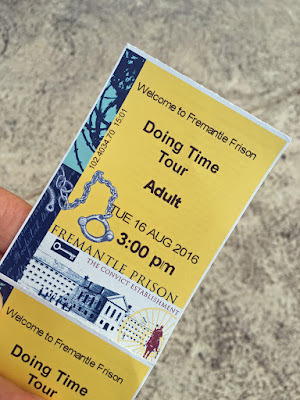 We also managed to get out of Perth and visited Fremantle (Frio) and heard about Frio Prison which was open from 1855 to 1991 , and was built by prisoners (Cheap labor) . 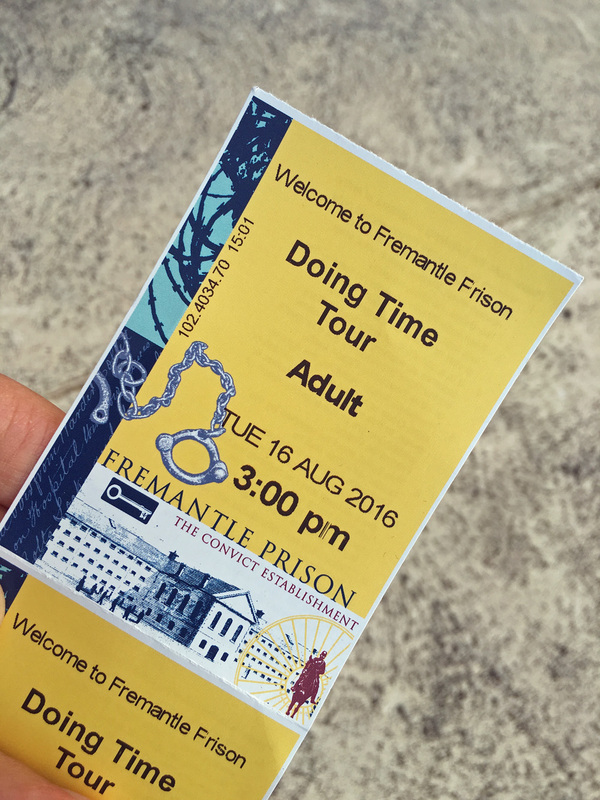 it was very interesting to see how jail life was and some of the facilities which had not changed in over 130 years. Especially that there was no indoor plumbing and each room had accommodation for two people and a bucket. We also managed to catch the sunset over the indian ocean with a frenzy of photography action until the sun could no longer be seen. 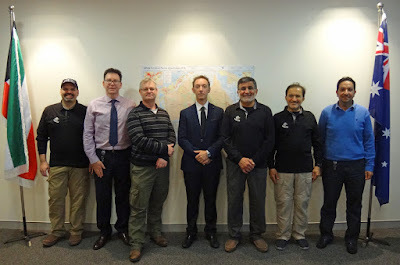 And since we are all upstream oil guys we visited KUFPEC (Kuwait Foreign Petroleum Exploration Company) offices here in Perth and got to meet Mr. Richard King who is the country manager and his staff , and got to know some of the projects that they are working on. 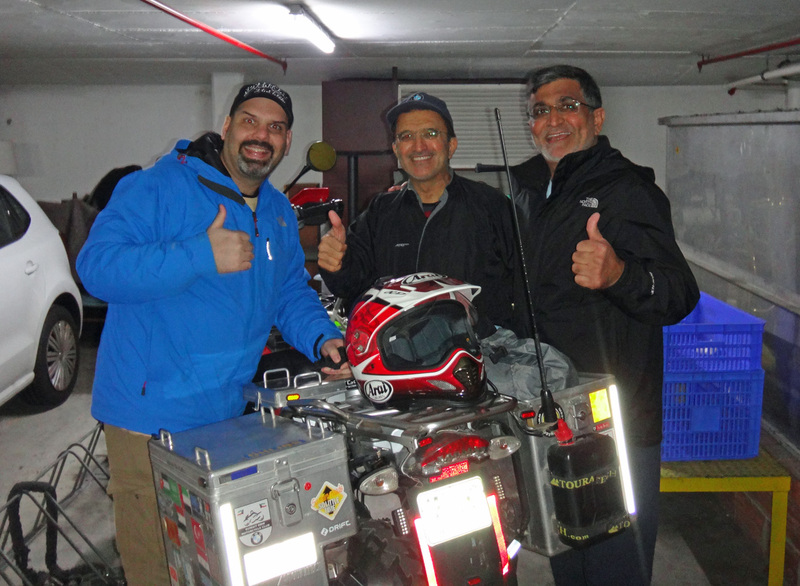 We also visited the local BMW Motorrad dealer here and picked up Husain's riding suit pants that he had ordered. I hope the bikes come soon , since we are running out of things todo. Yesterday evening we met Simon Mykolajenko, who we know through Sherri Jo Wilkins and is also a bike rider , He gave us some good advice on our route and we all had a good night of storytelling. Our flight from Kuwait was delayed for about 40 minutes on friday the 12th , with a marathon event going to Husain as he navigates the security regulations to get his Phantom 4 drone on the plan with a request to remove the batteries and wrap them separately. 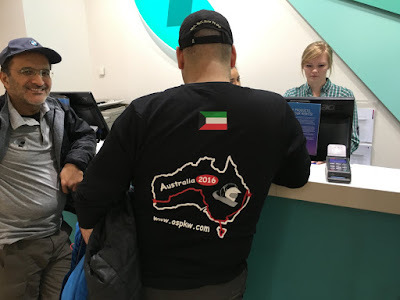 We only found out about the drone when we reached the airport. 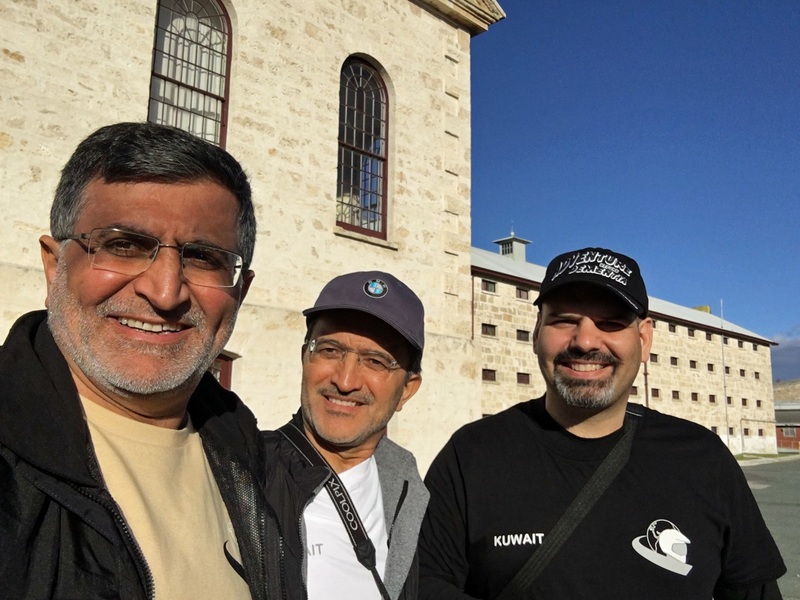 I was surprised that Ali also managed to get Kuwait TV Channel 3 to shoot a brief interview before we said goodby to our families and boarded the plane. A stop in Dubai and then a 10 hour flight to Perth and we arrive just after sundown. Airport formalities were easy and quick, and advice given to us from one of the security personnel to stay off the roads during dawn and dusk to avoid the many animals on the road. Today I got up reluctantly due to jetlag and wrong number phone call at 2 am that kept me up. We are staying at the Holiday Inn city center situated near all the fun stuff. We took a walk towards the river and started to hear enticing engine noises. After further investigation what we suspect was true , there was a makeshift track near the park and we got to see some nice cars running as fast as they can. We wanted to get sim cards for our phones since it makes no sense have roaming charges. looking online there are three network with many virtual networks running. I checked the coverage map for each provider and found that Telstra has the best coverage for what we needed, even though they are a little more expensive that the others (about 15 AUD per month extra). Tomorrow we call the clearance agent and find out when we can get our bikes. 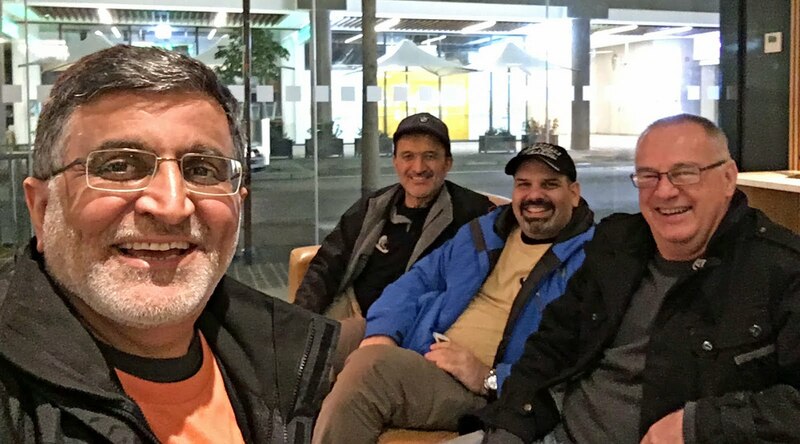 I told a friend recently that we never had a trip gone as planned , There are so many unknowns that you need to be flexible enough to go with the changes. But this time it's new , the change happened before we left. I found out yesterday that our bikes will be a week late. This is why Air freighting is a good idea unless you are flexible to move your plans a week which we are and hence we will start a week later than expected . 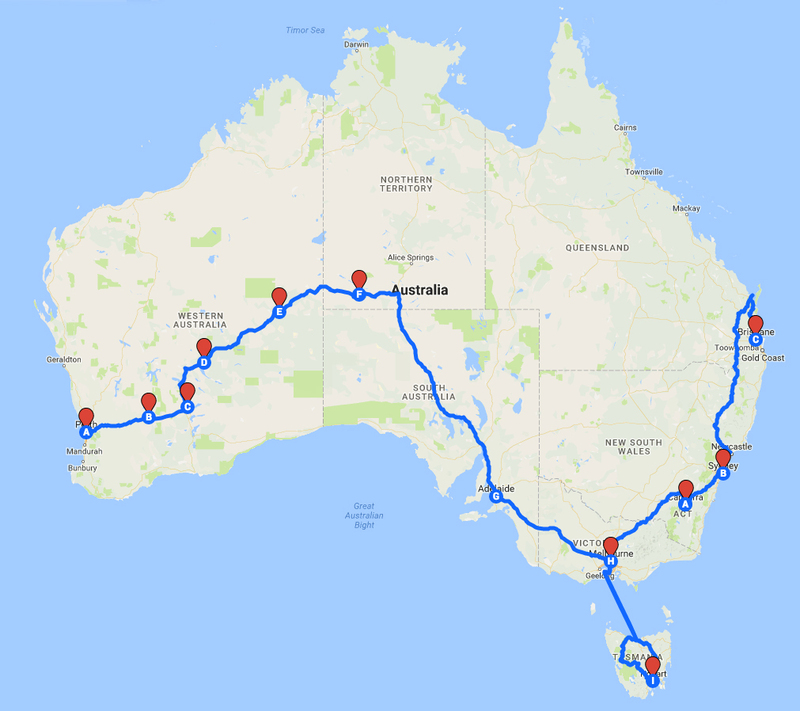 That said we plan to start our journey from the west (Perth) and go east (Brisbane) we are also looking at renting bikes in New Zealand for about a week to ten days since shipping them from Australia will be time consuming and we rather be traveling than going through the process of shipping the bikes and clearance.